A society full of contradictions, that asks us anything and everything. 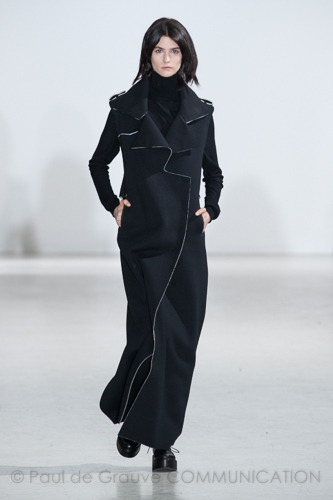 Thinking about the context in which we live and to the difficulties that today’s woman has to face on a daily basis, Ennio Capasa created a new collection Costume National for fall 2014. The intent is to break down the barriers between fashion and anti-fashion, between male and female, between constructed and deconstructed. The result is a wild girl, free from roles, relaxed and self-confident, not in compliance with society’s rules. The soft lines of the sporty style blend with tailoring style, more particular and elegant. Double-breasted jackets, suits and coats, have masculine cuts. Long trench-coats and sleeveless vests, faux fur long-haired or goat’s fur. Multilayer short skirts, oversized jumper dresses, typically spotswear volumes and shapes. The classic black and white are dominant colors, brightened by red, purple and gray. Bags and shoes follow the collection’s mood: shoulder bag in soft calfskin or shoulder belt, medium and small size, ankle boots or shoe lace-up men’s with wedge. As accessory we noted eyeglasses, with a minimalist design, square lenses, colour military green or black.